CooksRecipes has quality, kitchen-tested recipes for a variety of meatballs, made with ground beef, chicken, turkey and pork, that you can count on for successful deliciousness. Meatballs and ribbon noodles are a quintessential Swedish dish. 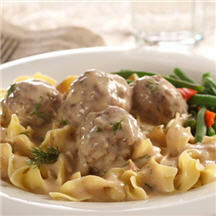 Seasoned with dill these tender and aromatic meatballs are the perfect partner for noodles and gravy. 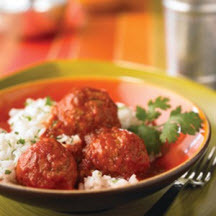 Smoky chipotle peppers in adobo sauce add the spicy to this easy meatball dish. Serve over hot cooked rice for a delicious entrée. 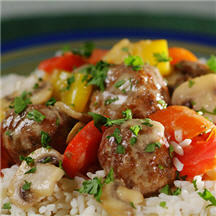 Chopped red and yellow bell peppers add color and texture to these savory meatballs seasoned with Italian herb mix and enhanced with mushrooms.